The NFL Strength of Schedule (SOS) is always a popular topic before each NFL season begins but its accuracy and usefulness is sub-par at best. The basic formula takes the win-loss records of teams from the previous season then adds them up to give you a list of the toughest to the easiest schedules by winning %. So what’s the problem with this method? The 2011 Rams were expected by many to win the NFC west division, with a supposedly easy schedule and by playing well in the meaningless NFL pre-season (4-0). Unfortunately they finished with 2 wins and 14 losses, tied for last overall in the NFL. If you took a closer look at the actual schedule you would have quickly changed your mind about the accuracy of SOS rankings and that’s before the San Francisco 49ers turned into a Super Bowl contender. If that’s one of the easiest SOS’s, what does one of the toughest ones look like you might say? Well….. Coincidentally and ironically the 2011 and 2012 St. Louis Rams Strength of Schedules are complete opposites of each other in terms of opponent’s wins and losses. But are they really that much different? No, not at all. Even though no one can predict which teams will be good or bad in the future, but you could almost say the 2012 schedule is easier than the 2011 one based on closer observation. The 2011 St. Louis Rams SOS was calculated as easy because of the previous weakness of the NFC West division which skewed the numbers. The 49ers improving from (6-10) in 2010 to (13-3) in 2011 completely changed that and added 14 wins to the SOS since you have to play each team in the division twice. That alone is already more than the whole difference in (wins-losses) between the 2011 and 2012 Strength of Schedules. Huge difference don’t you think? 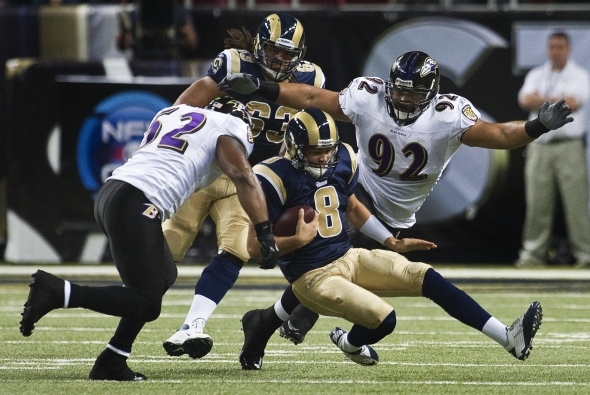 How will the 2012 SOS finish for the Rams? No one can predict that with any certainty so it’s best to go thru every schedule that interests you thoroughly and try to look for any outlier teams that may skew the SOS rankings. A great example of this is the 2012 Buffalo Bills schedule which the majority of people assume is really easy and has many Bills fans and experts anticipating a great season. A very quick look at the Bills schedule shows three teams that are influencing these rankings too much. The Browns (4-12), Colts (2-14) and Rams (2-14). Just taking these three games out of the SOS formula results in a SOS of 113 Wins 95 Losses (.543 %). The Bills 2012 SOS may not finish as the toughest overall like the 2011 Rams did but it is very unlikely it will finish as one of the easiest as predicted by the NFL strength of schedule. Even though it may be a little more work and rather tedious going over each NFL schedule in such detail, it will give you a much better idea in determining who really has a tough or easy schedule and what factors influence strength of schedule rankings the most. Are Russian NHL Players Chronic Underachievers? How often does the Public win in the NFL? Do Line Moves Matter in the NFL?